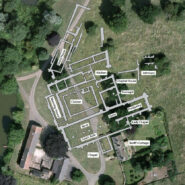 After much detective work – and with the help of a number of people – I’ve finally managed to discover the exact position of Croxton Abbey. Before its destruction on the orders of Henry VIII, it was one of the most powerful medieval monasteries in the East Midlands. Today, there’s very little evidence that it ever existed. The site was excavated over a number of years in the early 20th century by the then Marquis of Granby, grandfather of the present Duke of Rutland, whose family still owns the land. But although the plans were very detailed, they didn’t show the exact position of the abbey buildings on the ground. I’ve now seen copies of the original archaeological drawings, and they show the position of both the Baliff’s Cottage and the road. This has enabled me to plot the position on an aerial photograph from Google Earth. Click on the image at the top of the page to expand it. I’m still not sure the scale is exactly correct, but it must be fairly close. It’s also a lot nearer the fishponds than I expected. Most of the research I’ve read places it higher up the slopes – behind a line stretching from the ruins of Park House to the Baliff’s Cottage. There’s a lot of conjecture about some of the buildings – such as the infirmary and guest house. The plans also show that some buildings to the east were only partly excavated.These may have been a gatehouse or abbot’s residence. Click here for a detailed history of the abbey.